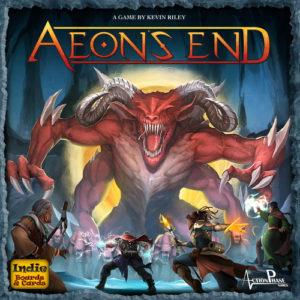 This Aeon’s End review is based on a total of eight games played – one solo, four two-player, one three-player, and two four-player games. 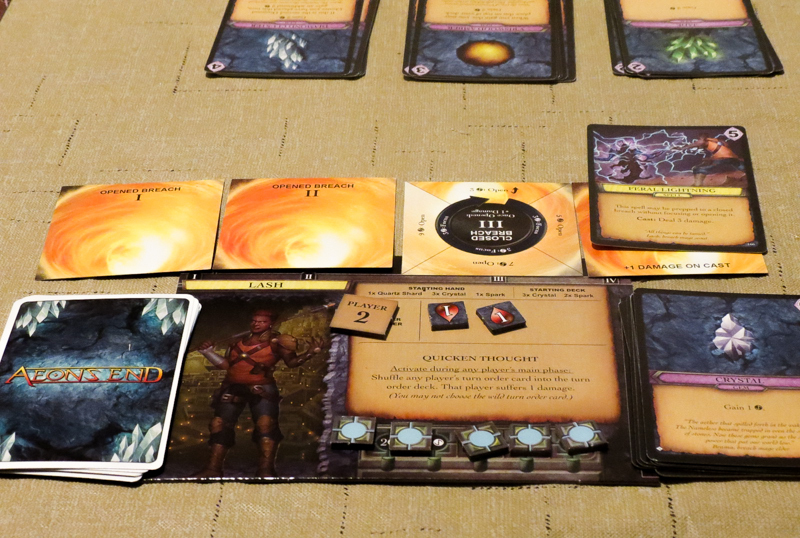 Aeon’s End is a cooperative deck building game in which you and your teammates are attempting to take down a member of The Nameless before it is able to destroy your home city of Gravehold. You do this by adding powerful spells, gems, and relics to your decks and strategically using them in a way that helps you defeat the enemies that come your way. Aeon’s End was designed by Kevin Riley. It’s published by Action Phase Games and Indie Boards & Cards. 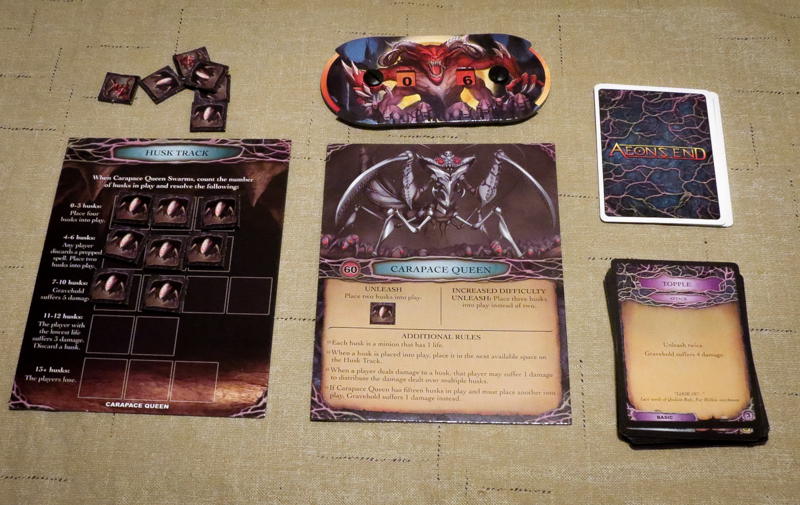 At the beginning of each game of Aeon’s End, you’ll set up your characters’ unique decks, put together a nemesis deck for the boss monster, and create a supply of cards that players can buy throughout the game. After all of that’s done, you’re ready to play! Turn order is determined by the turn order deck. 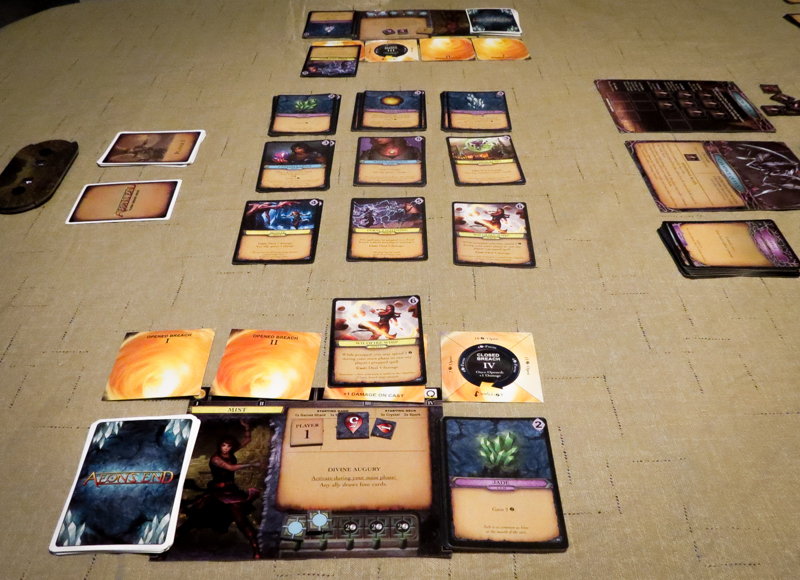 At the start of the game and after every turn, you’ll draw a card from this deck to see whose turn it is (the nemesis or a player). Aether is the currency in the game. You’ll use it to pay for new cards (spells, relics, and gems), to focus/open breaches, and to gain charges. You’ll start out with some basic cards that give you one aether apiece, but some of the cards you buy from the supply will give you more. You cast spells in a unique way in this game. Open breaches allow you to prep a spell without paying a cost, while closed breaches need to be focused or opened in order to use them. When you focus a breach, you simply turn it clockwise and pay the “focus” cost written on the card. The spells you prepped can be cast on your next turn; prepped spells in closed breaches must be cast, while those in open breaches don’t have to be if you want to wait until a future turn. Another unique aspect of this game is the way deck building works. Your deck is never shuffled, so you have to think about the order in which you put cards in your discard pile. When you cast spells or buy cards from the supply, those cards will go directly into your discard pile. When you use gems or relics, you’ll wait until the end of your turn and put them on top of your discard pile in any order. When your draw deck is empty, you simply flip your discard pile to create your new draw deck. Each nemesis in the game has its own deck of cards and special abilities. When the nemesis turn order card is drawn, you’ll first resolve the effects of any nemesis cards currently on the table, and then you’ll draw a new nemesis card. Each nemesis is quite different, but the cards and the nemesis mats will give you instructions for what you should do when specific keywords pop up. The main way to beat the nemesis is to take its life total down to zero, but you can also win if the nemesis’ deck runs out and there are no nemesis cards in play. You’ll lose if Gravehold is destroyed or if every player is exhausted (i.e. at zero life). That’s just a basic overview of how to play Aeon’s End. If you want a full rundown of how the game works, take a look at the official Aeon’s End rulebook at BGG. The variable turn order adds both tension and extra strategic options to the game. You can look at whose turns have passed and plan for the next few turns. Sometimes it’s great when the nemesis doesn’t take a turn early on, but it can also be disastrous when it gets the final two turns in a round. The breaches also create a new way to play this type of game. The delay in casting spells forces you to think about timing everything with your teammates. You can pull off some very cool combos when you buy the right cards. During some games your only chance of survival is by combining some spells into a massive amount of damage; when it works out, it’s amazing! We could not be happier with the flow in this game. The only turns that aren’t quick are the ones where the tension is super high, and no one is going to complain about slow turns in those moments. Most games go down to the wire. For the last few turns you’ll have no clue who is going to win, which is awesome! Even though there aren’t many bosses in the game (see below), there is plenty of replayability. The turn order deck, the random supply piles, and the nemesis decks make it so you’ll never play through the same game twice. It’s a bit of a shame that there are only four of The Nameless in the base game’s box. There are Aeon’s End expansions out there that add more, but six nemeses probably would have been perfect. A couple of the mages look really cool on the player mats, but most of them don’t really pop off of the mats. The artwork on the nemesis mats and on all of the cards in the game is nice, though. Aeon’s End is an amazing tabletop game. It’s a unique deck builder that has created a fun and tension-filled experience every time we’ve played it so far. The only people I wouldn’t recommend this to are those who absolutely despise fantasy games and/or deck building board games. There is a very good chance that this is going to end up on our Best Co-op Games, our Top 5 Deck Building Games, and possibly even our Top Two-Player Games lists. It really is that great. Update: Aeon’s End is now our #1 deck building game and high up on our best co-ops list! Thanks for taking the time to read our Aeon’s End review! To stay updated on all things cooperative board games, follow us on Twitter, Facebook, or via RSS.